Chondroectodermal dysplasia, also known as Ellis van Creveld Syndrome, is an autosomal recessive skeletal dysplasia that results in short-limbed disproportionate dwarfism. 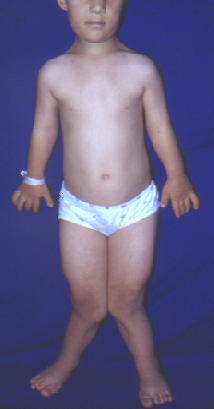 Affected individuals have short forearms and lower legs and a narrow chest with short ribs. They may also present with extra fingers and/or toes (polydactyly), malformed fingernails and toenails, dental anomalies, and heart defects. The most severe deformity present in individuals with chondroectodermal dysplasia is the genu valgum of the knee (knock knee deformity), which is caused by a lack of development of the lateral plateau of the tibia. Genu valgum of the knee is when the knees angle inwards even when the patient is standing up straight. In severe cases, the patient is unable to touch their feet together while standing straight. Chondroectodermal dysplasia is very rare, occurring between 1 in 60,000 to 1 in 200,000 live births. The condition is more common in certain Amish populations in Pennsylvania and certain indigenous populations of Western Australia. Chondroectodermal dysplasia is caused by mutations in the EVC or EVC2 gene. Not much is known about the specific function of these genes and their connection to chondroectodermal dysplasia, however they are linked to cell-to-cell signaling during cell growth, development, and specialization. The prevailing theory is that mutations to the EVC or EVC2 genes prevent normal cell-to-cell signaling in the developing embryo, resulting in the disruption of normal growth of bones, teeth, and other parts of the body. This condition is a recessive genetic condition, meaning both recessive copies of the gene are present in affected individuals. Parents of those affected are carriers of the recessive copies and usually do not show any symptoms. At the Paley Institute we primarily treat the severe genu valgum of the knee (knock knee deformity) using a specialized osteotomy (surgical bone cut) called a lateral plateau elevation.